ChafeX - not another lube, but new technology. I've been meaning to write a few words about this product since my last 24 hour race, the Run Around the World, in Nashville Tennessee a little over a month ago. It should be noted that this is my first product review and although I got this tube to try for free, I was not asked to write about my experience or promote their product in any way and I am in no way being compensated for this review. The Run Around the World was truly the first time I've done an ultra distance event without having ANY major foot issues. This dates back several years to my two 24 hour long Worlds Toughest Mudder events and into my more recent 50-100+ mile ultra events. During these races I've almost always had major issues with the outside of my big toes and my pinky toes. Before you ask or recommend something chances are that I've already tried it. I've tried just about everything! The list goes on, if someone recommended I try it, then I likely have. I unexpectedly ran into the two founders and developers (I think) of ChafeX (which is also a local Canton, MA based company) a few months back at the Sweltering Summer 8 Hour Ultra out in Pittsfield, MA. I was getting ready for the race when I saw what looked like these two guys handing out something that I haven't seen before, so I walked up on my way to the porto potty and grabbed a bottle out of the bag on the ground. I was quickly stopped and told that they didn't actually have any free samples, but they were letting runners try it out...on their hands...but that they were working on getting sample packets. I did the test sample on my hand and did notice a difference in the feel of my hand with and without the product. I certainly would have tried the product during the race (given my history of blister issues) but wasn't really given that option. Oh well. During the race, I saw them talking to Erica, our crew for the day and another Zoom Multisport member. They chatted for a while it seemed and I was hoping they would give her a tube or two for Tyler and I. It turns out that they did give us a couple of tubes to try out and got in touch with our tri-team president Lisa about presenting at our monthly happy hour, which they did a couple of weeks later. 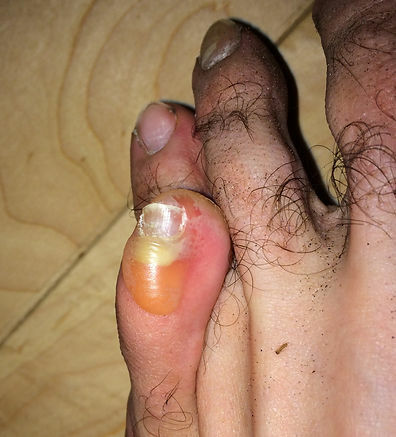 I tried the product on a couple of shorter 3-4 hour runs, but it's not really until about the 6-8 hour mark that my toes start to give me trouble, so I couldn't really tell if it would help or not in the long run until the Run Around the World 24 hour race. I applied the product in the morning as I was getting ready for the race, as the instructions provided on the bottle, or as shown in this video. Did you ever put glue on your fingers as a kid and let it dry then peel it off? Essentially that is what this product does, but with much more science behind it. You apply it until tacky and it provides a waterproof and protective layer over the skin. From their website: " ChafeX forms a durable, yet flexible MicroLayer which reinforces the protective cellular structure of the skin. The result is long lasting avoidance of skin irritations including chafing, blistering, inner thigh abrasion, jog bra lines, waistband and tank top marks." To my surprise, 6 hours, 8 hours, 10 hours into the race I wasn't feeling any hot spots or issues on my feet. I didn't want to get too optimistic so I tried not to think about it much but it was in the back of my mind for sure. I kept thinking that I may need to change socks or shoes or perform mid race blister surgery as in my last couple of 100+ mile efforts. None of this ever happened. I finished the race (in 1st place) and my feet looked and felt better than ever before. 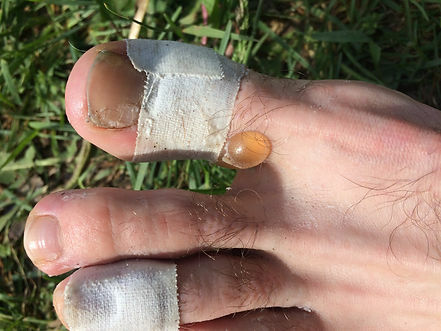 I still had a good sized blister on the top of my big toe, but I never noticed it during the race, nor did I apply the ChafeX to that area completely. I'll be sure to next time though! In short, this product has hopefully saved my feet and given me a better ability to show my endurance over the long run without having to worry about the blister issue any more. This will allow me to stay on the course longer and continue running without having to make pit stops to address my feet. Basically, if you ever have blister issues you owe it to your feet to give this product a try. I would recommend it.